I blame Greg for this one. Again. Greg, being a truly manly man, displays his miniatures proudly in display cabinets. This idea appealed to me, but I didn't have a display cabinet. Then I moved house and got an extra book shelf. Which meant I could unpack most of my VHS collection (yes! Real Men still watch VHS, the tape format of... err... well the tape format that won the format wars unfortunately...) from the Solicitor's Bookcase. Which in turn meant my multitudinous mutated men could live there! Huzzah! Behold the might of the Display Cabinet (of or pertaining to Doom). Note the remaining part of the VHS collection on the bottom shelf. The bottom shelf is hard to see, and I don't really have space to shift these tapes to, so they may remain here. Note also the glorious WWS Wooden Spoon certificate at the back - haven't had a chance to hang it yet. The Nurgley wing of the top shelf. Including such luminaries as the prototype Slug Knight (a mounted sorcerer) and the ancient Giant. The Khorney wing of the top shelf. Including my loveable Chaos Dragon in his minute magnificence. The middle of the upper shelf. 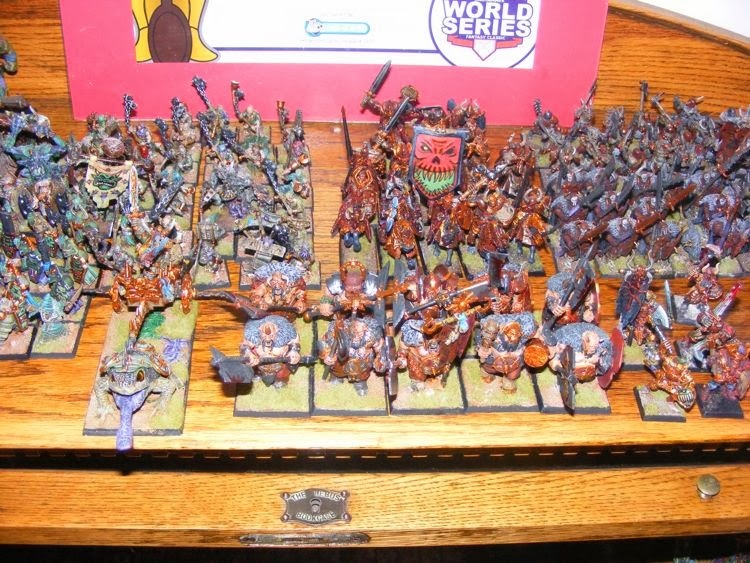 Mostly ogres, Lecturers at the Old School (my all-metal Chaos Knight unit, most of whom even have metal horses) and the terrible tongue of the toad tumbril. The lower shelf, which features the Vulgar Goatmen, and some appalling camera flash (the light is not very good, and my camera is a bit old, so it needs a lot of light to take shots...) Either that or the Tuskgors are firing off a thundershock. Clan Skitterclaw take up the middle of the shelf. It's amazing how much difference 5mm off each base makes when you're dealing with units this size. I didn't originally think I would be able to fit them in as well as all my Chaos. 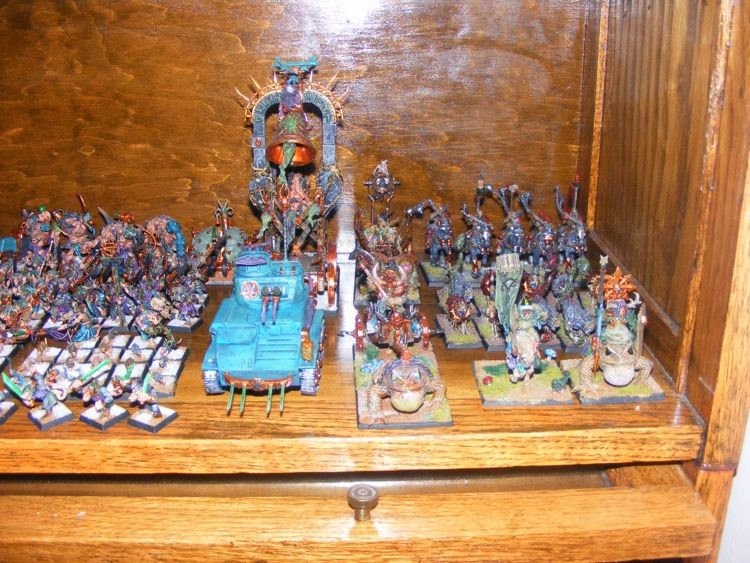 Finally there's the Big Skaven Stuff and the Chaos Overlap. As you can see, space is very tight, so if I make any more units, I'll need to find somewhere else for either them or the remaining VHS collection. So if you call yourself a man, be a member of the clan, the clan of the cabinet displaying man! Just with better lighting, naturally. You may recall in 2012, Greg 'The Hoodling' Johnson popped out of his hole, and said "I declare this the Year Of The Empire!" before seeing his shadow and popping back in, dooming us to six more weeks of winter (only he did this in Australia, so it was summer...) As a result of this dedicated YOTE, Greg's purple and white legions grew to enormous sizes and allowed for such moments of inspired madness as The Battle of Hel Fenn. 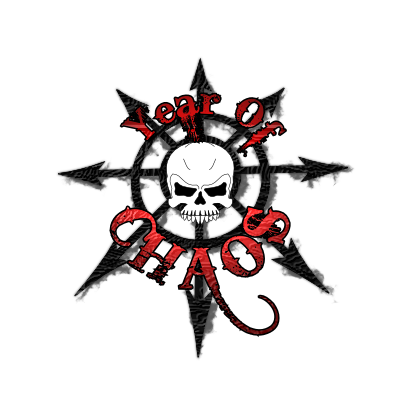 So I've decided to do the same thing, by declaring 2014 the Year Of Chaos! What does this strange madness mean? I'm going to concentrate on painting things for my Chaos armies. By the end of the year, I will have armies painted for all four powers. By the end of the year, I will have built shrines to all four powers and Chaos Undivided. I will build more 'realms of chaos' style terrain. I will (finally!) get the Gates of Kislev done. Okay, so I already have an extensive Chaos army (about 9000 points of raw figures without magic items, however, I have four different BSBs, so the actual army which can be made is smaller than that). The existing units are roughly split between Khorne and Nurgle. 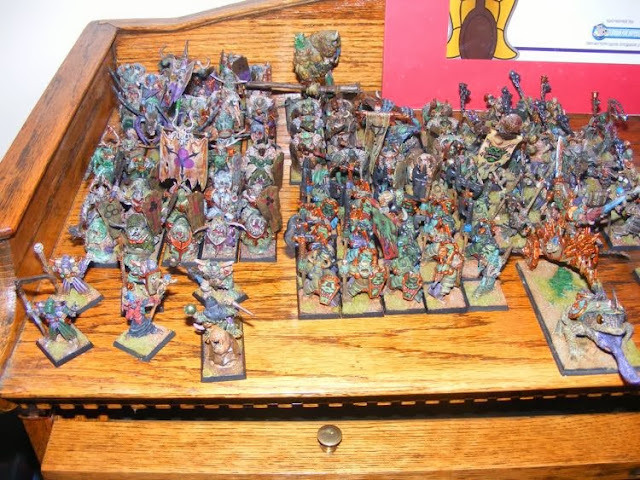 I started playing Nurgle when I first started playing 6th ed Warhammer, so I actually have some old units which don't really fit the army's more modern look. These are being refurbished. The Khorne stuff is more recent, but I have got roughly as many servants of the blood god as the plague brethren. This means I need to get units for Tzeentch and Slaanesh. I've already got some figures slated for Slaaneshi purposes. Because I don't think Slaaneshi units would wear the big, heavy, bulky style of chaos armour that the Chaos Warrior figures wear, I'm going to be using converted Dark Eldar heavily in the Slaaneshi army. "Incubi - I Choose You!" - Slaanesh proves to be a Pokemon fan. 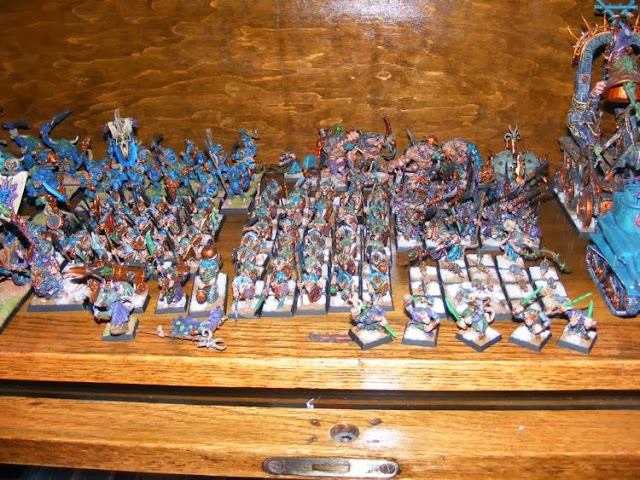 I've also got plans for the Tzeentch army. I like the idea of all the Tzeentch troops looking a bit wizardly, so I'm planning on using Mantic Basileans with some conversion work for this army. Robes AND heavy armouor? How Tzeentchi can you get? 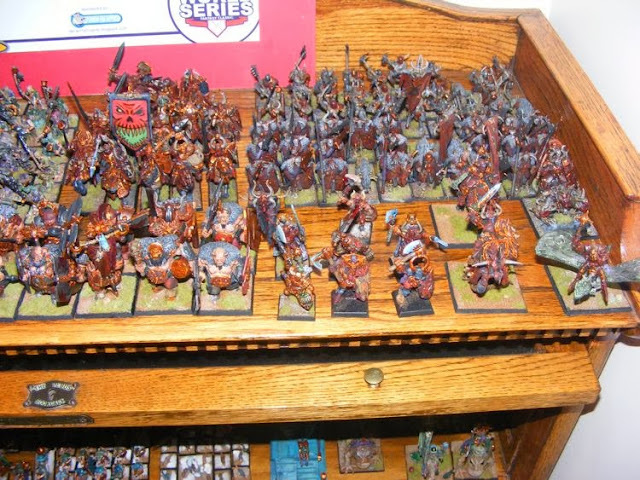 The Beastmen, who currently number only 1500 points, will be expanded upon. 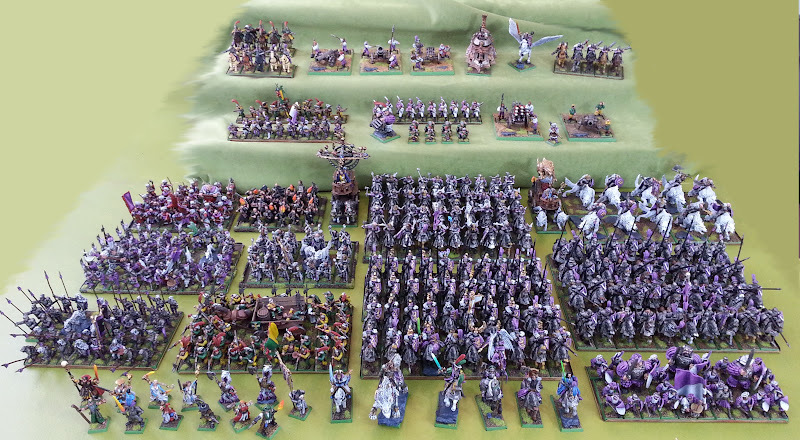 I have quite a few unpainted figures for them, which I will get to in due course. One day my extra arms will come. And I will sprout a bull's head. And be a Ghorgon. As to the terrain pledge; I already have the Palace of Forbidden Pleassures (Slaanesh) the Blighted Altar (Nurgle) and the Levitating Altar (Tzeentch), so I need to build a Bloody Shrine (Khorne) and an Undivided Temple. I also plan to make some terrain which will support these shrines. This does not mean I will build nothing but Chaos terrain this year - I'll have commissions to do, and other projects will crop up. However, by the end of the year, I will have these shrines. 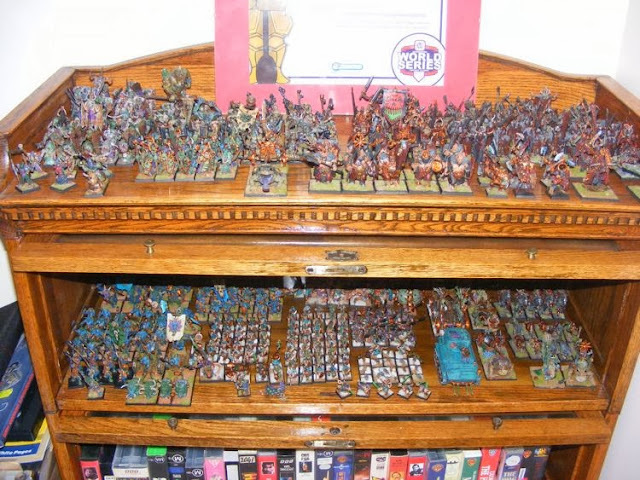 And naturally, I will need to get the Gates of Kislev built for the mighty battle of the Gates of Kislev which Greg 'The Hoodling' Johnson keeps threatening - we're pretty sure we'll be running it around Easter this year! Huzzah! 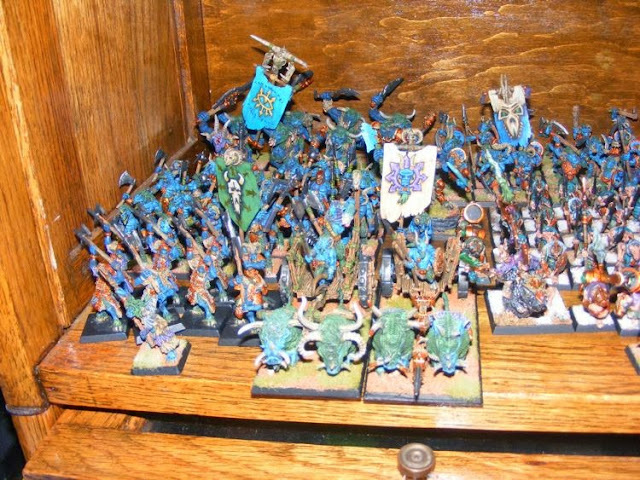 This is the pic of the battle from the WFB rule book. Ours will be more awesome.